What is it about December? The month clicks over and instantly my calendar is full. Every weekend and every Tuesday night (my Tom free evening), is now taken until after Christmas. We had a pretty busy first week, though we started slow on Monday by meeting up with a friend for a rather windy walk over Walthamstow Marshes and up past the reservoirs by Coppermill Lane. Having had a good long walk in the morning, it seemed ok not to brave the now rainy weather and stay indoors in the afternoon for some screen-free play. Wednesday was a rather sad day, because we had to go to the funeral of a friend’s mother. I did have a slight wobble in confidence shortly before leaving, wondering if it was actually appropriate to show up to the funeral of a non-family member with a toddler in tow. The friend in question is one of Tom’s godfathers though and I had no one to leave Tom with (Mr Techno was working), so we went. Tom behaved pretty well, though he did ‘chat’ through a few bits of the service. We stood at the back and I took him out about fifteen minutes before the end when it looked like he might start crying. We had a wander round the cemetery waiting for everyone to come out. I think it was the right choice to go – Tom struggled towards the end but didn’t really know what was happening and we were able to be there to support his godfather, who gave a really beautiful eulogy. His mother was an amazing woman and it was wonderful seeing so many people come to celebrate her life and support her family. A very sad day but also a hopeful one hearing about a life so full and so well lived. 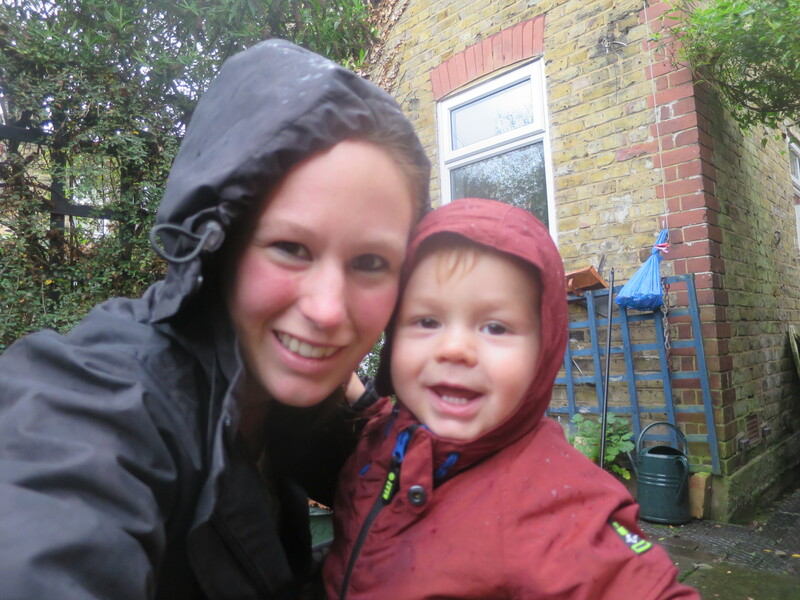 Thursday and Friday were work/nursery days, so Tom and I walked to nursery and back as usual. The wind was pretty strong both days and Tom struggled to keep his balance, so he didn’t want to stay for long in the park on our way home. We had a lazy start on Saturday, as Mr Techno wasn’t starting work until midday, so we spent the morning at home as a family. After Tom’s afternoon nap, we headed out into the winds to forage up some Christmas decorations for the flat. On Sunday, we had our first Christmas party of the month, heading to Oxfordshire to the home of Tom’s great-grandmother (Mr Techno’s maternal grandmother). The whole of that side of the extended family was there and I think Tom was a bit overwhelmed by the parade of great-aunts, great-uncles and various cousins. Though he was very pleased to see his cousin Rose, who is just five weeks younger than him. They get on so well and I’m really excited to see them both enjoying Christmas together when we all gather at Mr Techno’s parents’ house in Suffolk. We did manage to escape into the garden with the numerous family dogs between courses – a three course meal with coffee is a lot for toddlers to sit through! Some fresh air and a run around ensured good behaviour for the seated parts of the meal. Fortunately, Tom crashed out in the car both on the way there and the way back, as the journey took us about 3 hours. A busy week and a very worn-out toddler by the end! Posted on December 9, 2015 December 7, 2015 by LucyPosted in Weekly UpdateTagged Christmas, East London, Family, Funeral, Leyton Jubilee Park, Marshes, toddler, Walking.